The Americas host large reserves of a panoply of resources: base and precious metals, water, oil and gas, and so on. Some of these have turned into the fortune of some nations and the misfortune of others. Herein, I cover some selected resources in the Americas-- covering all of them would require volumes. 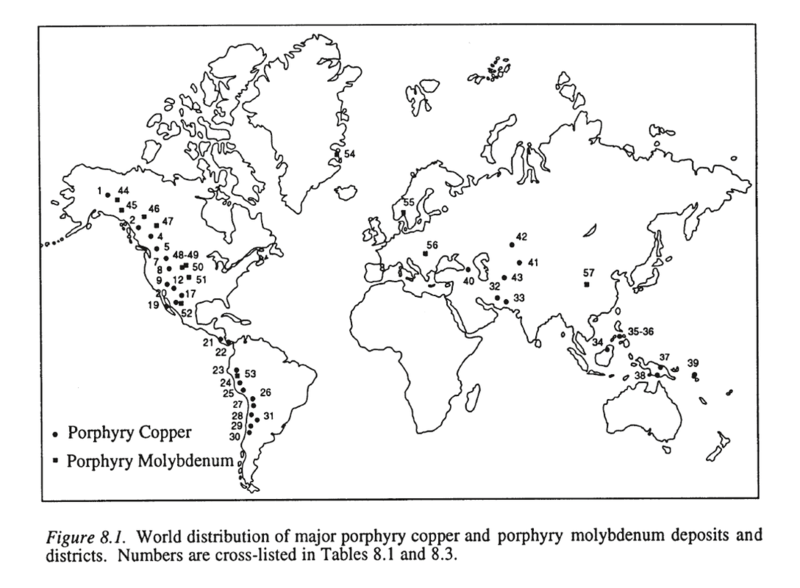 First, porphyry deposits are significant resource of copper, gold, tin, and molybdenum in North and South America. Porphyry deposits in the Americas are located at the western margin of the continent within late Mesozoic to Cenozoic continental arcs. Porphyry deposits are associated with multiple stages of igneous intrusions and certain deposits show a strong structural control for their emplacement (Misra 2000). Camus (2001) and Cooke (2005) emphasized the connection between the shift from deep subduction to shallow-flat slab subduction regimes for generation of porphyry deposits. Drew (2005) noted the predominance of porphyry deposits in fault duplexes of strike slip zones. 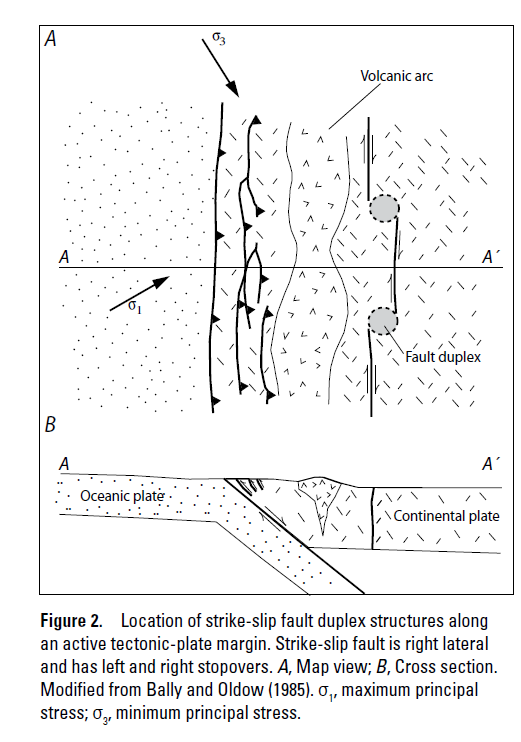 Fault duplexes are areas of tension between the tips of adjacent strike slip fault. Essentially, this pulls the rock apart and creates the accommodation space for porphyry emplacement. Furthermore, the evolving deformation regimes can largely explain the morphology of these porphyries as well- that is, brittle deformation imparts the cylindrical surface expression of porphyries giving way to more-ductile along strike morphology at depth. This is a similar mechanism that generates pull apart basins (see video below). Climax-type porphyry deposits are unique to North America. They occur mostly in the interior of the American west with the highest concentration in Colorado and are generally younger than more western copper porphyries. They represent the world’s largest source of molybdenum (Luddington & Plumlee 2009). They are associated with extensional tectonics of the Rio Grande Rift and slab roll-back after the Farallon and Kula plates stopped subducting under western North America. Plutons are more felsic than copper porphyry systems (Chapin 2012). Many are acquainted with the fabled California and Klondike Rushes of the the 19th and early 20th centuries where prospectors panned for alluvial gold in streams. However, another significant source of gold in the Americas lies in so called epithermal high and low sulphidation deposits (proximal and distal to volcanoes respectively) and Greenstone Belts. The most productive Greenstone belt deposits are located in or around the Superior Province in Canada. These include mines in Timmins, Red Lake, and Quebec’s Abitibi region. Host rocks are usually-- but not exclusively--upper greenschist metavolcanic rocks. While a protracted debate continues between those researchers favoring a metamorphic devolatilization origin for gold versus a magmatic one, structure is the most important deciding factor in gold distribution (Misra 2000). Gold is focused along high-strain shear zones on continental scales. These intense deformation zones are attributed to crustal shortening or intrusion of magmatic stocks. The deposits themselves are housed in ‘second order structures’ related to the major shear zones and are believed to deposit at the brittle-ductile transition (see figure below for reconstructed history of overlapping brittle ductile features). Gold is best concentrated in dilated areas within shear zones imbuing these deposits with a rod like geometry (Hodgson 1983). Epithermal deposits are an additional important gold source. While epithermal deposits are spatially linked with porphyry deposits, they are temporally and mineralogically distinct. They usually form after the main pulse that deposited the porphyry base-metals either proximal to the intrusion (aka high-sulphidation) or distal (aka low-sulphidation). In contrast to porphyry deposits, they are overwhelmingly composed of precious metals such as gold and silver. Hydrothermal fluids responsible for epithermal deposits are believed to originate from the porphyry system. Therefore, tectonically controlled pathways play an important role in channeling and concentrating these fluids (Misra 2000). Stilltoe (2003) recognized that different epithermal style deposits congregated in different tectonic regimes-- more specifically, high sulphidation are present in neutral to compressive tectonic regimes whereas low sulphidation are ubiquitous with extensional back arc or post-collisional rifts. Different epithermal deposits in tectonomagmatic settings (Stilltoe 2003). For instance, the Pascua deposit along the El Indio Belt in Chile and Argentina reflects many of the convergent features. Pascua is related to the volcanism generated by subduction of the Nazca Plate beneath South America. Similar to the Kula-Farallon Plate in North America, the Nazca Plate also underwent increasingly shallow subduction and the El Indio Belt has a complex history of convergence punctuated by periods of extension (Chouinard et al 2005). All ore deposits in North America are beyond the scope of this webpage. I encourage those interested to read Understanding Mineral Deposits by Kula Misra. Some additional deposits to research include VMS, BIFs, and Mississippi Valley Type (MVT) Pb-Zn deposits. The last, in particular, has important tectonic and structural geology implications for its genesis. Agricola, Gregorius. De Re Metallica. Dover Publications, 1950. Chapin, Charles E. "Origin of the Colorado Mineral Belt." Geosphere 8, no. 1 (2012): 28-43. Chouinard, Annick, Anthony E. Williams-Jones, Robert W. Leonardson, C. Jay Hodgson, Pedro Silva, Carlos Téllez, Javier Vega, and Fernando Rojas. "Geology and genesis of the multistage high-sulfidation epithermal Pascua Au-Ag-Cu deposit, Chile and Argentina." Economic Geology 100, no. 3 (2005): 463-490. Cooke, David R., Peter Hollings, and John L. Walshe. "Giant porphyry deposits: characteristics, distribution, and tectonic controls." Economic Geology 100, no. 5 (2005): 801-818. Drew, Lawrence J. A Tectonic Model for the Spatial Occurrence of Porphyry Copper and Polymetallic Vein Deposits: Applications to Central Europe. US Department of the Interior, US Geological Survey, 2006. Hodgson, C. Jay. "The structure of shear-related, vein-type gold deposits: a review." Ore Geology Reviews 4, no. 3 (1989): 231-273. Misra, Kula. Understanding mineral deposits. Springer, 2000. Schenk, C.J., Brownfield, M.E., Charpentier, R.R., Cook, T.A., Klett, T.R., Kirschbaum, M.A., Pitman, J.K., Pollastro, R.M., and Tennyson, M.E., 2012, Assessment of undiscovered conventional oil and gas resources of South America and the Caribbean, 2012: U.S. Geological Survey Fact Sheet 2012–3046, 4 p.
Sillitoe, RICHARD H., and JEFFREY W. Hedenquist. "Linkages between volcanotectonic settings, ore-fluid compositions, and epithermal precious metal deposits." Special Publication-Society of Economic Geologists 10 (2003): 315-343.